Metrics are a foundational element of every Customer Experience (CX) program. With all the metrics available–including industry-standard ones and internally-developed ones–it can be hard to determine which ones to track on a regular basis. Our experience has taught us that many of the most important metrics to monitor are the ones that provide the most insight into customers’ perceptions about your company. And sometimes those metrics may not be the ones you would consider mission-critical from a management perspective. For example, if you lead a call center, shortening call times may be a top priority since it ties directly to cost and team efficiency. But does that mean your agents should rush customers through a support call? Would the overall happiness of your customers go up if your customer support reps took the right amount of time to address customers concerns–and helped make sure customers felt that their individual needs were met? Undoubtedly, efficiency-related metrics are important, but insights that tell you about how customers feel about their experiences deserve attention. We often recommend that our clients routinely track the ratio of positive to negative feedback left by customers to help them keep a pulse on customer sentiment. Paying attention to your positive and negative feedback ratio can help protect your company’s reputation. Ignoring it can cause lasting damage–especially if customers turn to online reviews to vent their frustration. For every one-star review, a company must receive four five-star reviews, if they want to maintain an average of four-stars. Customers who have had a negative experience are often more likely to leave negative reviews. In his observation, approximately one out of 10 happy customers leave a positive review after a good experience with a brand. 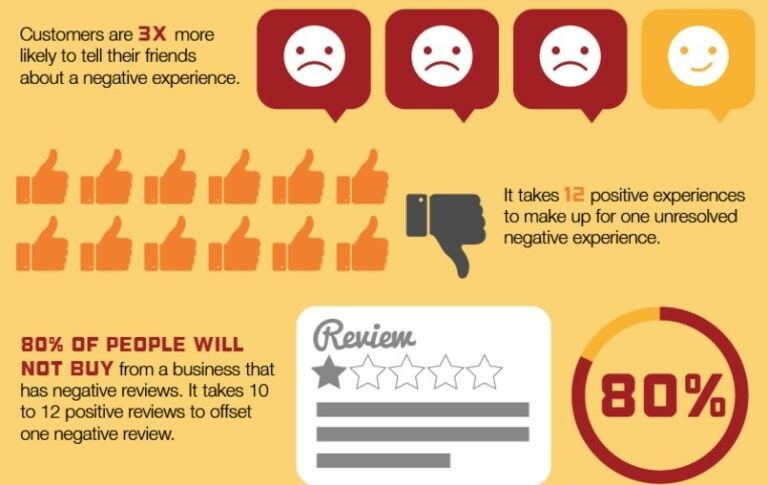 Based on those number, it can take 40 positive customer experiences to offset one negative online review. Even if a company can restore its rating with four five-star reviews, it takes more positive comments to offset the negative perceptions created by a single poor review. Research from Vision Critical has revealed that customers need to see ten to 12 positive reviews to make up for one negative review. And 80% of customers are unwilling to buy from companies with negative reviews. Although many organizations do a good job of managing negative reviews, they can take proactive steps to prevent them from happening. Tracking your positive to negative feedback ratio helps you keep a pulse on customer sentiment and fix troubling trends. A strong closed-loop alerting foundation–that sends alerts to frontline managers for follow up after customers leave low scores or comments–is also essential. Making a commitment to track positive and negative feedback can help you derive value from all of the open-ended voice of the customer (VoC) comments you receive. 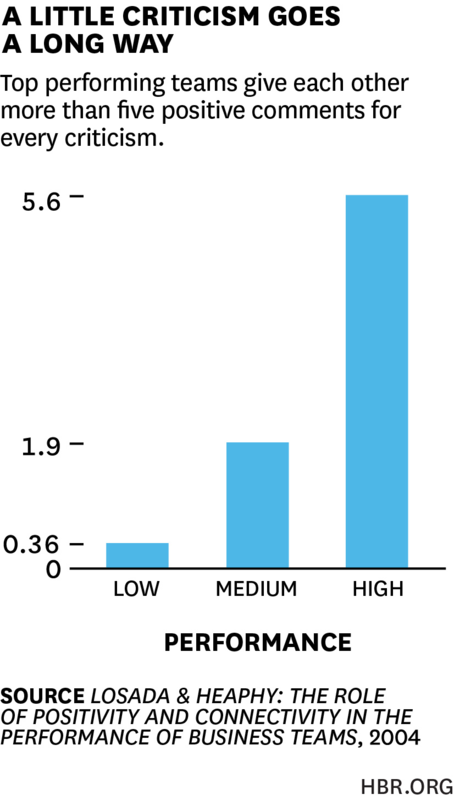 The first step in determining your ratio is determining the sentiment of customer comments. 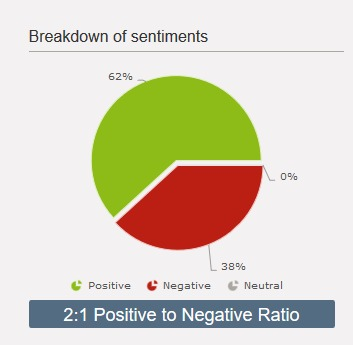 You can assign broad sentiment categories–such as positive, negative, neutral, or mixed. Based on that information, you can determine how many negative and how many positive comments you receive from customers. 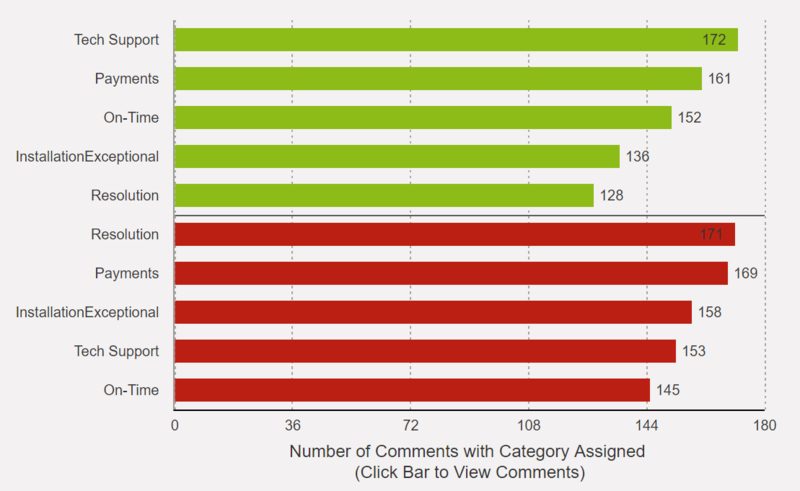 Companies often see a ratio of three or four positive comments to every one negative comment (so a 3:1 or 4:1 ratio). If they start to see the ratio shift, with more negative comments left by customers, that can be a good indicator of service-related issues that need focused attention. It can also be very valuable to determine key themes in your customer comments. That practice can allow insight into the top three to five areas of concerns for your customers and empower you to make meaningful changes that directly influence the customer experience. Another benefit of this practice is that it can allow you to remediate specific customer issues or tackle larger problems to prevent negative sentiment from escalating to company leaders, regulators, or into the public eye. 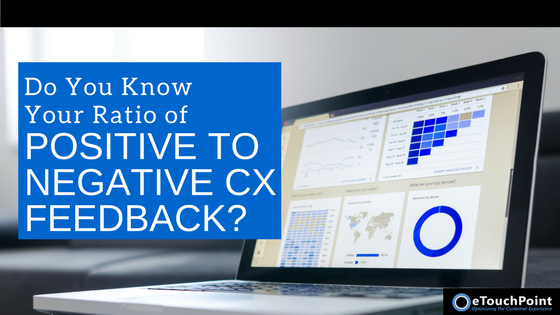 One tactic CX innovators use to keep employees’ motivation high is sharing positive customer comments with frontline team members. Our experience has shown that 60% to 80% of customer feedback received by companies is positive. So most organizations should have opportunities to pass along positive feedback from customers to employees. Even though addressing missteps is important, organizations should be careful not to over-focus on negative issues. The reason? Research published in the Harvard Business Review reveals that high-performing teams focus on praise instead of criticism. In fact, in those successful organizations, team members give each other more than five positive comments for every one critical comment. Companies should always look for ways to share praise from customers with their employees–whether through informal feedback from managers, team meetings, or well-defined recognition programs. Today, companies often collect open-ended feedback from customers–but few have developed specific practices to derive meaning from it. Tracking your positive to negative feedback ratio is a step in the right direction. Often, organizations that track this ratio add it to their CX dashboards used by operational leaders and stakeholders. This keeps this vital metric in view and can help ensure appropriate actions occur if the ratio slips in a negative direction. In addition, keeping track of your positive to negative sentiment ratio can help minimize negative online reviews and all the hard work that must go into managing and counterbalancing them. And you can motivate your team by letting them know about your feedback ratio–and make feedback personal by sharing positive comments left by customers. A focus on your positive to negative feedback ratio can help elevate your CX practices and help you connect more authentically with the needs and feelings of your customers.